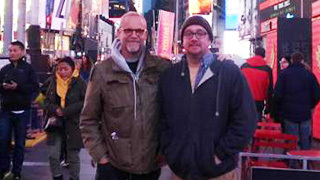 Recipient Robert Leibowitz (left) poses with his kidney donor Richie Sully in Times Square. Robert Leibowitz owes his life to a message on a T-shirt. The Brooklyn native's kidneys were failing — functioning at just 5%. But the list for a transplant was long and he worried he'd run out of time. So, he hit upon a plan. He headed to Disney World. 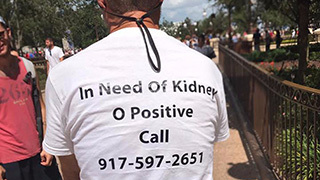 For a week, Leibowitz walked around the park, wearing a T-shirt that read: "In Need of Kidney. O Positive." Below the message was his cell phone number. "Maybe it's my advertising background," Leibowitz told CNN. "I didn't know what was going to happen. But when you get desperate, you'll do anything." Leibowitz, 60, had suffered from chronic kidney disease for 15 years. "I was on the transplant list for the deceased for four years at multiple hospitals...but the problem is for a deceased donor, there is a 7- to 10-year waiting list," he said. "Some people don't even make it 7 to 10 years on dialysis." At Disney World, tourists clicked photos of the shirt. One couple posted their snapshot on Facebook-- and the magic happened. By the end of the day, the post received 32,000 shares. By the end of the week, 90,000. Hundreds of people called wanting to help the man with the shirt. But it was still a longshot. "Just because you are a blood type match, doesn't mean...you're going to be a match," Leibowitz said. "They look at every enzyme, every single tissue. There are so many details they have to do." Four people flew to New York for testing. Three were denied. But one man was the perfect match. Richie Sully was giving blood at the Red Cross when he spotted the viral Facebook post. He called the number on the T-shirt, and left a voicemail. "Hi, my name is Richie. I saw your post and I'm O positive. I have an extra kidney and you are more than welcome to it." Sully says it just felt like the right thing to do. "He knew he had an expiration date. He knew he had a shelf life. I saw this as a desperate act. I couldn't think of a reason not to call the guy. It's just seemed like this is something you're supposed to do." The two men hope their shared story brings awareness to live organ donation. They both point out that the act -- and the impact-- go way beyond a check mark on your driver's licence.